The Bates Model clarifies executive presence as a three-dimensional model of character, substance, and style. Character is an over-used and often misunderstood word, but in the context of leadership, character is one’s inner core, made up of facets shaped by temperament and early life development. Character is the most foundational level of the leader as a person… but it’s also the least observable. It’s made up by courage, optimism, integrity, discretion, and priorities. Leaders need to not only identify and clarify personal values but behave consistently with them as they lead the organization. Style is the most overt behavioral manifestations of communicative leadership. It’s the first impression people make– based on image, mannerisms, and interpersonal behavior. Whether we like it or not, style must be congruent with what people know and believe about a leader and their role in the organization. With some leaders, perceived problems with style may prevent people from appreciating their underlying substance and character. We may “tune out” or “write off” a leader based purely on relatively superficial observations about style. 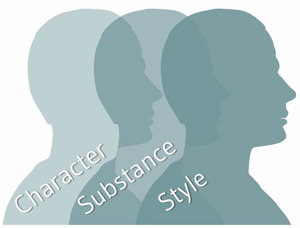 The Bates ExPI™Assessment evaluates leaders’ strengths and needs within 15 distinct facets of the three dimensions of Character, Substance and Style.